Ancient Indian scriptures have given some secret amulets to ward off, remove and destroy evil energies, evil spirits , and ghosts of all kinds as also malefic and destructive frequencies and vibrations which are always present in the atmosphere. These amulets are believed to be tried and tested in exorcism of evil. I am giving in this post two such experiments which will be of great interest to the readers of this site. These amulets are used in exorcism rituals in India. Write this Amulet on a leaf of the Peepal [Sacred Fig] tree with any kind of ink. Then tie it around the neck of the person affected by evil spirits. The offer incense to the Amulet by rotating the incense sticks around it. 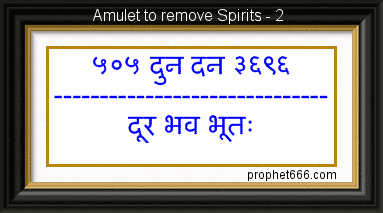 Write this Amulet on a Bhojpatra with any kind of ink. Then offer the incense of Loban [Styrax benzoin] to the amulet. Then tie the amulet around the neck of the ghosts affected person. please translate, can the amulet write in tamil ? You can make the Yantra on any day and at any time.